Multiple sclerosis or MS is a chronic, progressive nervous system disease. In this article, we explore its symptoms, causes, diagnosis and treatment. The identical twin of someone with MS (who shares all the same genes) has a 25% chance of developing the disease. Multiple sclerosis (MS) disrupts communication between the brain, nerves, muscles and other parts of the body. It is an autoimmune disease in which the immune system attacks the myelin sheath—the protective covering around some nerve cells which speeds transmission of nerve signals. This results in slowing of nerve impulses and damage to the nerves fibers. MS affects approximately 400,000 Americans, and about 2.5 million people worldwide. First symptoms are usually experienced between the ages of 15 and 60, (peak between 30 and 50). Symptoms vary significantly between individuals depending on which nerves are impacted. Visual disturbances (often an early sign) include blurred or double vision, red-green color distortion, shaky eye movements (nystagmus) or pain and partial blindness in one eye (optic neuritis). Fatigue, cramps and muscle weakness often in the face, trunk or limbs. Dizziness, tremor, coordination and balance problems, lead to unsteady gait and falls. These symptoms may progress to partial or complete paralysis. Sensory disruption may include numbness, pins and needles, pain or pricking feelings. Electric shock sensations may result from neck movement. Speech and hearing may be affected, along with cognition, attention, memory and mood. Depression is common feature. Bipolar disorder and dementia may occur in later years. Chronic pain. Up to 50 percent will suffer from it during the course of the illness. Relapsing-remitting (RRMS) is marked by an unpredictable pattern of relapses (recurrence of symptoms or new symptoms) and remissions (full return to the person’s level of functioning). Remissions can last anywhere from a month to many years, during which time symptoms may occur when they overheat. This type is most common. Approximately 60 percent will develop secondary progressive at some time. In primary-progressive MS, there is slow but continual worsening of functioning from the beginning. Secondary-progressive MS begins as RRMS and develops into a steadier progression of disability without relapses. Progressive-relapsing MS is a slow but continual worsening of functioning from the beginning. Occasional remissions occur along the way. Family history of MS (in up to 35 percent). Infections, most notably Epstein-Barr (also know as mono). Ethnicity. People of Northern European descent are at highest risk. Living in temperate climates, including northern United States, Canada, New Zealand, northern Europe, possibly due to vitamin D deficiency. Autoimmune diseases, including type 1 diabetes, thyroid disease, or inflammatory bowel disease. Blood tests to help rule out other illness: infections such as Lyme disease, lupus, vitamin and mineral deficiencies, and inherited neurological diseases. 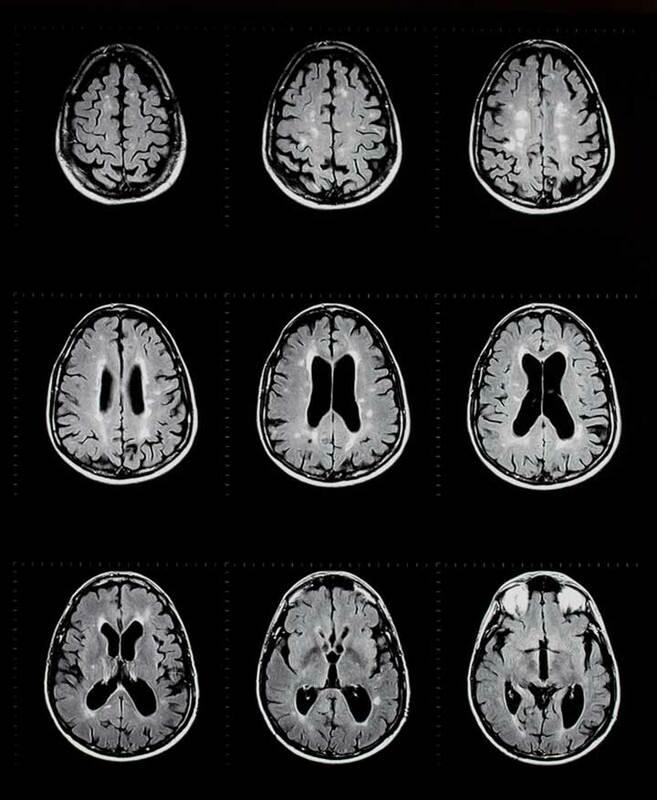 Magnetic resonance imaging (MRI) to look for signs of demyelination. Evoked potentials, which is a test of electrical activity of the brain in response to stimulation. Lumbar puncture or spinal tap to perform cerebrospinal fluid analysis. Misdiagnosis is common. Researchers are trying to develop biomarker tests, which would improve diagnosis and treatment of MS. There is currently no cure for MS, but treatments may help to relieve symptoms and slow the disease process. Steroids may be useful during an acute attack to reduce inflammation. They do not alter disease progression. Plasma exchange (plasmapheresis) is a technique in which blood is drawn and the cells and plasma (liquid portion) separated. The cells are combined with albumin (protein solution) and given as an infusion. This treatment is used for those with recent onset of severe symptoms, who do not respond to steroids. Some people, on the other hand, do well with no drug treatment at all. Eat well. Reducing intake of processed foods, meat and sugar and increasing intake of water, vegetables, fruits, lean proteins and healthy oils may help reduce inflammation in the brain. Balance rest and exercise. Get plenty of rest, but also make time for exercise such as swimming, walking, low-impact aerobics, tai chi and yoga. Avoid overheating, which may trigger symptoms. Stress reduction. For you this may be spending time in nature, yoga, meditation or massage, whatever works! Get support. Living with MS can be difficult for the sufferer and their family. Getting the right support can help. This may be from friends and family, a support group or doctor, coach or therapist. The National MS Society can help you find a local support group. Monoclonal antibody drugs (e.g. ocrelizumab / Ocrevus) are FDA-approved for primary progressive MS.
Other FDA approved drugs include Copaxone, Gilenya, Aubagio, and Tecfidera, all of which address relapsing forms of MS.
Immunosuppressant treatment, Novantrone, is approved for the treatment of advanced or chronic MA. Ampyra can improve walking in individuals with MS. The American Academy of Family Physicians recommends other specific medicines to treat common symptoms such as urinary problems, constipation, depression, erectile dysfunction, pain and muscle stiffness. Physical and occupational therapies can help reduce disability and pain. Braces, canes and walkers may help preserve mobility. Most sufferers may need to use a wheelchair or mobility scooter at some time, but many will not become wheelchair dependent. Speech, cognitive, and psychological therapies, as well as antidepressant drugs, may also be beneficial. Mind and body practices, such as yoga, acupuncture, and reflexology. Dietary supplements, such as Ginkgo biloba and vitamin D.
Cannabis products. Though controversial there is mounting evidence that a group of phytochemicals called cannabinoids found in the cannabis family of plants (including hemp and marijuana) may help with muscle control in MS and other symptoms. THC is a psychoactive cannabinoid, famous for creating the “high” with marijuana. Cannabidiol / CBD is a non-psychoactive cannabinoid with neuroprotective properties: See our article on CBD for more information. People often confuse multiple sclerosis, ALS (the most common motor neuron disease and Duchenne muscular dystrophy (DMD). The table shows the notable differences. Cause Multiple factors including genetics (up to 35%) and environment. Autoimmune inflammation. Most cases are “sporadic”. 5-10 percent are inherited. Genetic. Age of onset Peak 30’s and 40’s Peak 55 and 75 Peak 3 to 5 years old. Mostly boys. Progression Most commonly relapsing remitting. Causes disability but may only shorten life by a few years. Progressive and ultimately fatal. Most commonly within 2-5 years following diagnosis. Progressive and often fatal by the age of 30.
als, antidepressant, antidepressant drugs, bipolar disorder, bowel disease, brain, chronic pain, constipation, cramps, dementia, depression, diabetes, dietary supplements, dizziness, erectile, erectile dysfunction, exercise, ginkgo biloba, health, hearing, immune system, inflammation, inflammatory bowel, inflammatory bowel disease, integrative, integrative health, lupus, lyme disease, massage, meditation, memory, mobility, mood, multiple sclerosis, muscle, muscle stiffness, myelin sheath, novantrone, pain, pins and needles, processed foods, protein, reduce inflammation, Scooter, smoking, stress, stress reduction, stroke, sugar, supplements, thyroid, type 1 diabetes, vegetables, vitamin, vitamin d, vitamin d deficiency, Wheelchair. I thought you might be interested in this article on https://universityhealthnews.com: What Is Multiple Scleroisis?